Tami of the fabulous food blog Runing With Tweezers has come up with a delicious way to enjoy cauliflower. 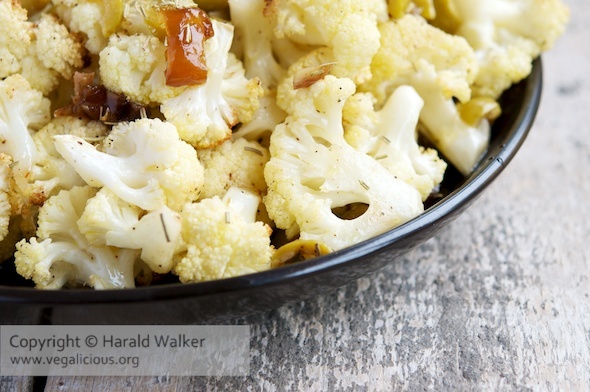 This is a wonderful combination of sweet dates with salty olives and pungent rosemary brought to the lovely nutty flavor roasted cauliflower. What a dream. It was very easy to make this a vegan recipe by using vegan margarine instead of butter. This recipe would be a pleasing side dish for any meal, and especially at holiday times. Posted by Chris Walker on November 16, 2011 in Cauliflower, Dates, Olives, Reviews.